I ran into Wen some time ago when she just opened a new store as her very own. Wen had been a designer with OMG! Inc., but she launched on a project to have her own outfits in her own store. She had some wedding gowns and some coloured gowns for the bride maids when I walked in. This was my first encounter with Wen. It’s been about a month or so since then. She had been sending me pics of her new releases and I couldn’t believe how quickly she was turning into a great gown designer! Even when she started, she was already quite impressive with the textures she was using but now she is acquiring new skills to create interesting gowns on top of her texture skills. The purple Wen chose for this gown is just right to give it an almost royal feel to it in addition to the top part that gives it a bit of a classic touch. The basic design is simple, but it’s these small details that give the gown a very nice look and feel that makes you feel like a princess. I am now convinced that Wen Winkler will be one designer I need to keep my eyes on. Written and modeled by Kay Fairey, model for Boulevard Agency, Evane Models Agency, Ewing Fashion Agency, the Best of Italian and Second Look Studio. 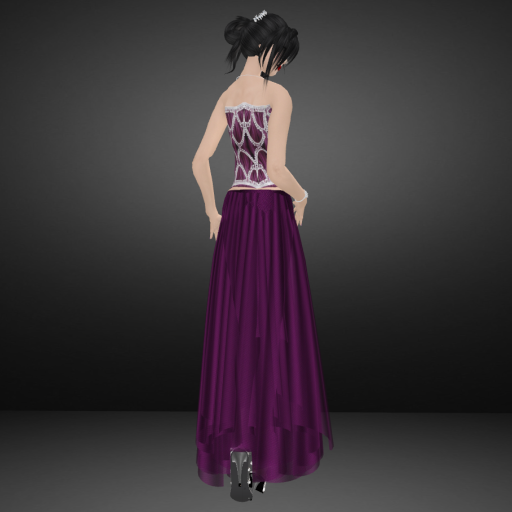 This entry was posted in Uncategorized and tagged Gown, Kay Fairey, second life, sl fashion, Wen'd Wedding Dream by Kay Fairey. Bookmark the permalink.